To get information in Spanish place the arrow of your mouse on the highlighted words without clicking. Para obtener información en español acerca la flecha de tu ratón a las palabras o frases resaltadas. For the past few weeks, Americans have been preparing for Christmas. People have been buying gifts to give to family members and friends. They have been filling homes and stores with evergreen trees and bright, colored lights. They have been going to parties and preparing special Christmas foods. Many people think Christmas is the most wonderful time of the year. Many Christians will go to church the night before the holiday or on Christmas Day. They will celebrate Christmas as the birthday of Jesus Christ. Christian ministers will speak about the need for peace and understanding in the world. This is the spiritual message of Christmas. Church services will include traditional religious songs for the holiday. 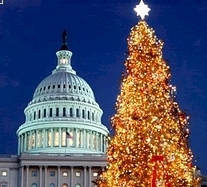 Many other Americans will celebrate Christmas as an important, but non-religious, holiday. To all, however, it is a special day of family, food, and exchanging gifts. Christmas is probably the most special day of the year for children. One thing that makes it special is the popular tradition of Santa Claus. Young children believe that Santa Claus is a fat, kind, old man in a red suit with white fur. They believe that – on the night before Christmas – he travels through the air in a sleigh pulled by reindeer. He enters each house from the top by sliding down the hole in the fireplace. He leaves gifts for the children under the Christmas tree. Americans spend a lot of time and money buying Christmas presents. But some people object to all this spending. They say it is not the real meaning of Christmas. So, they celebrate in other ways. For example, they make Christmas presents, instead of buying them. Or they volunteer to help serve meals to people who have no homes. Or they give money to organizations that help poor people in the United States and around the world. Home and family are the center of the Christmas holiday. For many people, the most enjoyable tradition is buying a Christmas tree and decorating it with lights and beautiful objects. On Christmas Eve or Christmas morning, people gather around the tree to open their presents. Another important Christmas tradition involves food. Families prepare many kinds of holiday foods, especially sweets. They eat these foods on the night before Christmas and on Christmas day. For many people, Christmas means traveling long distances to be with their families. Another Christmas tradition is to go caroling. A group of people walks along the street. At each house, they stop and sing a Christmas song, called a carol. Student groups also sing carols at schools and shopping centers. Not everyone in the United States celebrates Christmas. Members of the Jewish and Muslim religions, for example, generally do not. Jewish people celebrate the holiday of Hanukkah. And some black Americans observe another holiday, Kwanzaa. Yet many Americans do take part in some of the traditional performances of the season. yet many: aún así muchos.